What is Moss Melt Concentrate? 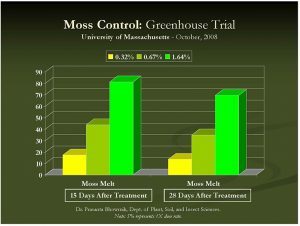 Moss Melt is a high concentration, low dose contact herbicide for the control of moss & algae that has just received full EPA registration. Moss Melt contains d – limonene, or citrus oil extract, a powerful, natural degreasing agent that strips away the waxy cuticle from moss & algae, causing fast wilting (necrosis), dehydration and death. Moss Melt is a 70% concentration material; thus little bit goes a long way. 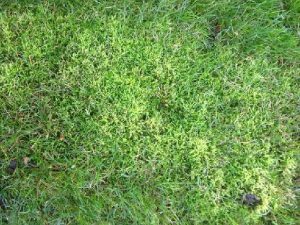 One gallon of Moss Melt will treat 12,500 sq. ft. of regular moss and 8,333 sq. ft. of thick moss. For general purpose broadcast applications, use product at a ratio of 1 part Moss Melt into 50 parts of water (2%) spray solution (2.56 ounces / gallon of water) For best performance thorough coverage of moss or algae is necessary. The volume required per 1000 sq. ft. will depend on density of moss. At least 3.5-4 gals per 1000 sq. ft. is recommended to insure adequate coverage. Moss Melt is fast acting, effects will be seen within one – three days. Treated moss will turn a light yellow to dark orange color. 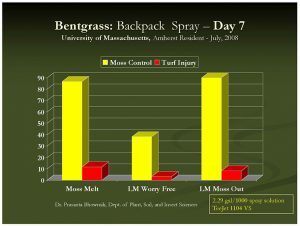 Moss Melt has shown to be effective in university and independent trials, as well as, commercial use: killing moss more effectively than competitive herbicides. Unlike fatty acid products Moss Melt leaves a pleasant citrus odor during and shortly after applications. Where can I use Moss Melt? Moss Melt is labelled on surfaces such as Roofs, Driveways, Fences, Decks, Siding, Steps, Patios, and Other Outdoor Surfaces constructed of Composition Shingles, Wood, Asphalt, Concrete, Brick, Tile, Stone and Plastic Resins. 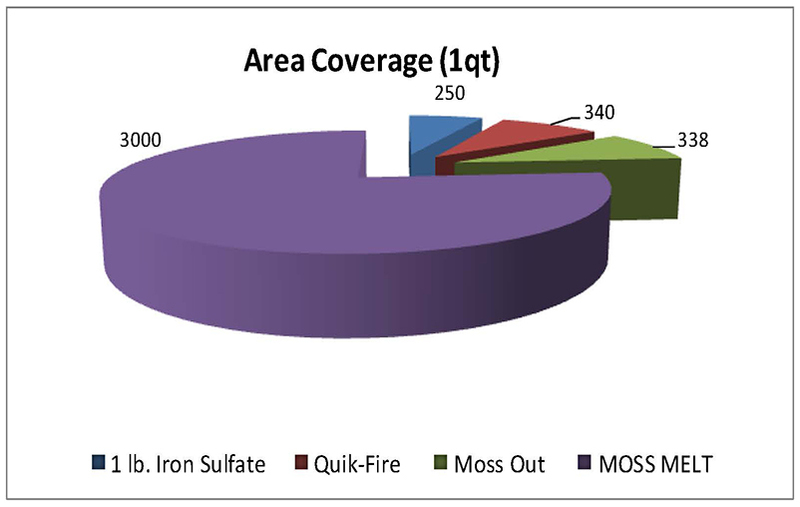 Moss Melt carries the lowest pesticide signal word of “Caution” reducing concerns about applicator exposure. It also meets the “NOP” organic guidelines and will soon be OMRI organic listed. It is non toxic and treated areas can be entered once product dries. Moss Melt is highly biodegradable and results in no ground water contamination or toxic residue. 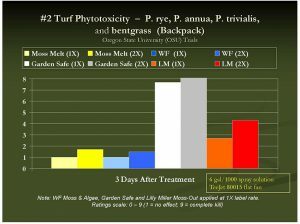 Moss Melt covers significantly more area than competing products. 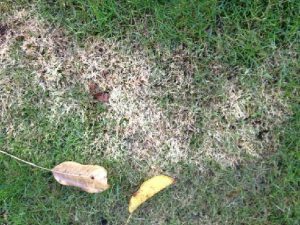 It would require 50 pounds of iron sulfate to treat the same area as one gallon of Moss Melt Concentrate. 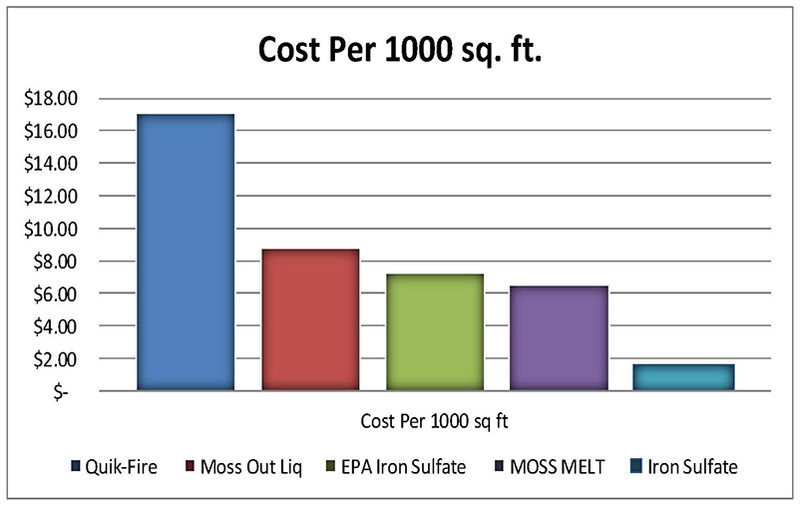 Moss Melt provides a safe effective option for Moss & Algae control at cost that is lower than most EPA registered products. 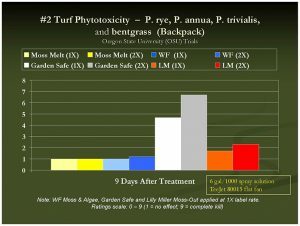 Your eco-friendly cost effective moss & algae herbicide! applications on commercial and residential sites. © 2016 Green Spear, Inc.. All Rights Reserved.